At the Masters golf tournament, even losing can be lucrative. When the purse — $11 million in 2018 — is divided up, even the golfer in 50th place wins more than $27,000. Not too bad for a few hours’ work. But there is one prize you can’t win at the Masters: a hole-in-one car. When pro golfers pull off the astonishing feat of hitting an ace at Augusta, as three players did on the 16th hole in 2016, they win fame and applause… but no new ride. It’s a possibility at other golf tournaments, however — even for amateurs. How Does a Hole in One Car Contest Work? Hole in one car contests are a reliable draw for golf tournaments. People love the idea of winning a car for a single shot. And tournament organizers don’t have to buy the car up front. Instead, they buy hole in one car insurance: a special insurance policy that pays for the car, if someone sinks an ace. The organizer pays a premium based on a few factors: the number of people playing, the value of the car, and the length of the hole. So, for example, if you have 72 players and you’re giving away a smart fortwo, you might pay around $300 for hole in one car insurance. But if you have 100 players, and the prize is a sweet Mercedes-Benz E550, the premium might be $1,170. If you’re competing in a hole in one car contest, do make sure everything’s in order. PGA golfer Matt Kuchar made a hole in one at the WGC-HSBC Champions in Shanghai in 2016, but was denied the prize because the tee had been moved up to 193 yards from the hole, just shy of the 200 yards required by the hole in one car insurance policy. (Later, Kuchar was given the car anyway; he picked a 2017 Cadillac Escalade.) And his lucky streak continued: Kuchar made a hole in one at the 2017 Masters. How Hard is it to Hit a Hole in One? Well, it’s not easy… but it’s not as hard as you might think. For a pro golfer, the odds are about 2,500 to one, according to The National Hole in One Association. For an amateur, the odds rise to 12,500 to one. When golfer John Hudson hit two consecutive holes in one during a tournament in 1971, the estimated odds of accomplishing that feat were 50 million to one. (No one has ever hit more than a single hole in one at the Masters — yet.) The average golfer plays for 24 years before hitting a hole on one. Make sure you understand the official rules for hitting a hole in one. You must hit the ball from a standard tee, for instance, and you must play a round of at least nine holes, with one ball only. (In other words, you can’t whack a bunch of balls down the green, hoping for a hole in one.) Also, you need at least one credible witness. Hitting an ace yourself may seem pretty unlikely. However, the odds of winning the Powerball lottery are about 292 million to one. So if you’re feeling lucky, you should enter a hole in one car contest. What Are Some Tips for Winning a Hole in One Car? Let’s say you’re a decent weekend golfer who really, really wants to win a hole in one car. Can you do it intentionally? What’s the best way to hit a hole in one? Luck has a lot to do with it, obviously, but the experts have some advice. “Come to the tee with confidence,” advises GolfLink, and square your shoulders to the target. Then, hit the ball hard and high: “If you are going to miss, miss long.” Or, just “try hitting it closer to the hole,” famed golfer Phil Mickelson once said. Very helpful. And if you happen to be playing Augusta, focus your energy on the 16th hole. That’s where the three golfers hit aces at the 2016 Masters, as did Kuchar in 2017. The other lucky hole is the sixth. What Should You Do After Hitting a Hole in One? Jumping, screaming and running around wildly are all perfectly appropriate reactions. After that, you should take a few pictures and put the lucky ball in your pocket. Then, keep playing! Remember that you must complete at least nine rounds for the hole in one to officially count. Sign your scorecard and report your accomplishment to the club. 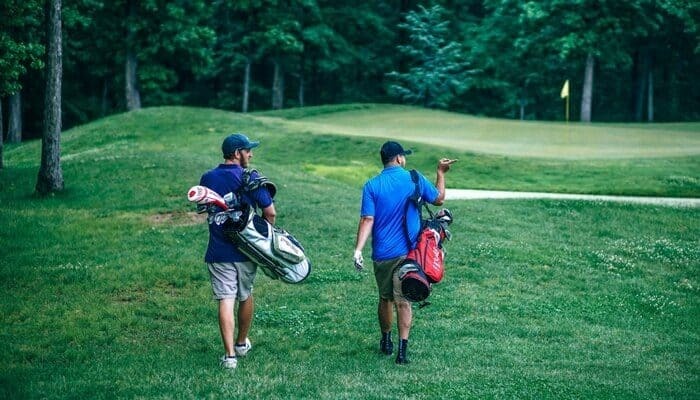 Hole-in-one etiquette then dictates you buy a round of drinks for everyone in the clubhouse. Yes, this can get expensive. Which reminds us: If you’re a lucky duck who wins a hole in one car, don’t forget to insure it. Compare.com is the place to compare accurate, unbiased and personalized quotes for auto insurance so you can get the best possible deal. Try it today!